Alex Hales has been named in England’s squad for the ICC World T20 in India next month. 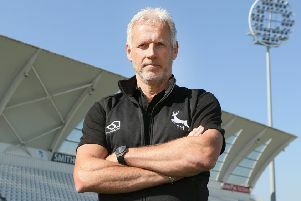 The 26-year-old Nottinghamshire batsman is ranked third in the world in the shortest format and remains his country’s only centurion in 20-over cricket. Hales, who struck six successive sixes in Notts Outlaws’ victory over the Birmingham Bears during the 2015 NatWest T20 Blast, is likely to continue his established partnership at the top of England’s white ball order with Surrey’s Jason Roy. Eleven of the 15-man party are currently in the squad for the 50-over series in South Africa, which England lead 2-1 with Hales having scored three half-centuries. Sam Billings, Steven Finn, James Vince and prospective debutant Liam Dawson, a left-arm spinning all-rounder with Hampshire, are the four newcomers. Former Sri Lanka batsman Mahela Jayawardene will join the coaching team for the first ten days of the tournament with former England T20 captain Paul Collingwood working alongside Trevor Bayliss, Paul Farbrace and Ottis Gibson for the duration. “The limited-overs cricket played in the last eight months has been incredibly exciting to watch and these players deserve the honour of representing England at a global event,” said National Selector James Whitaker. “We have made significant progress during recent series with plenty more to come over the next few years. “Liam Dawson has been selected after consistently strong performances for the Lions recently against Pakistan A. As a left-arm spinning all-rounder he will be a very useful addition particularly in sub-continent conditions. Team Director Andrew Strauss added: “Mahela and Paul proved very popular additions to the coaching team when they spent time with England in the UAE earlier this winter and I’m delighted that they are both able to help our T20 side.